On my painting holiday to Florence in 2013 I felt I had made good progress with my sketchbook. 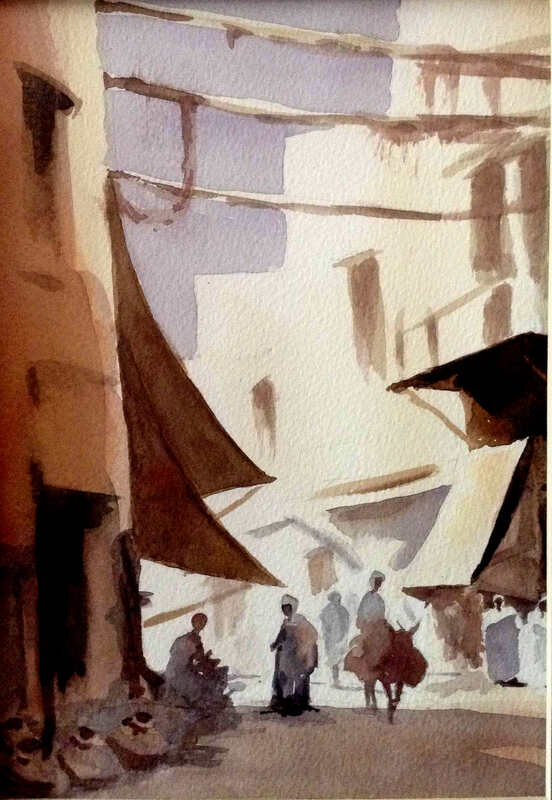 The line and wash paintings of Florence, Lucca and Pisa worked well in the sketchbook, plus the drawings of the statues were newly learnt techniques and felt satisfying. 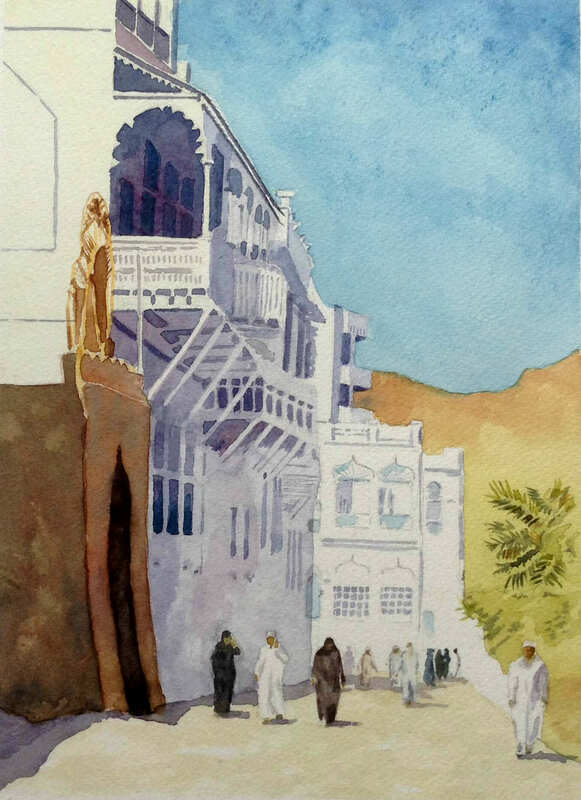 However, the one area that I completely failed was in producing a typical watercolour on location. The two attempts were very disappointing and I’ve been trying to work out what I need to do to rectify this for my trip to Morocco. I’ve looked at paintings of North Africa and the Middle East on Google images and pinterest that I find represent the colours and flavour of the region. The images need to be produced on location and in a short time. I’ve painted them to see what I can learn from their construction and composition. As I don’t know who owns the original paintings I can’t show them on this blog but I feel I have captured their essence. 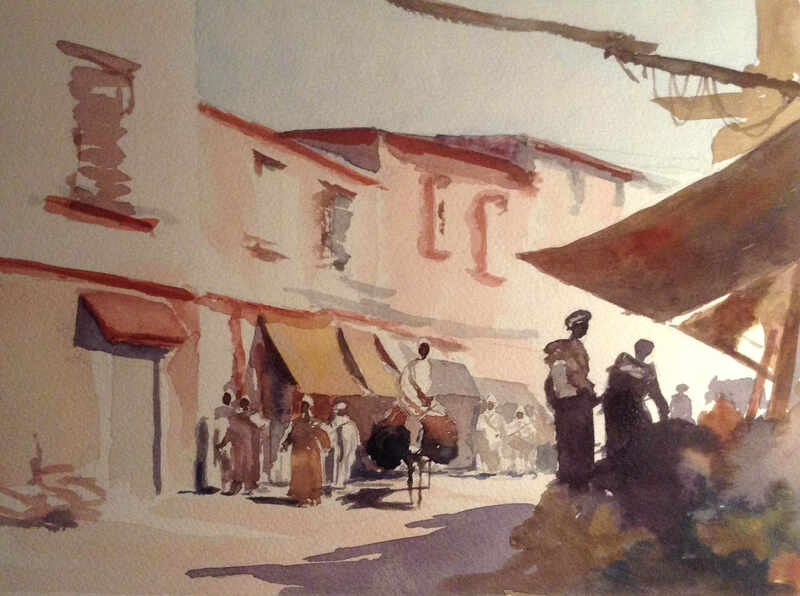 The first shows a market scene with locals, donkey and sun shades. The buildings are very simple but basic perspective makes the picture work. The sky colour is almost purple but the focus is on the people and donkey. The extreme darks in the shadows provides depth and the curve in the street lends an air of mystery. The pots provide a simple but needed detail. The people are essentially silhouettes. The second picture is from the same artists (if anyone knows who it is please tell me) and follows similar principles to the first picture. Its not as mysterious but the donkey is a strong part of the picture as well as the two silhouettes. I will produce a follow up post on my attempts in Morocco when I return…. Great paintings Hugh. Well done.